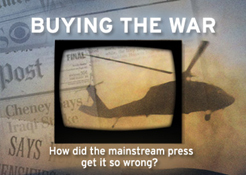 Bill Moyers interviews former talk show host Phil Donahue and Ellen Spiro on the true cost of war and their documentary, BODY OF WAR, depicting the moving story of one veteran dealing with the aftermath of war. With extensive excerpts from the film, the filmmakers talk about Iraq war veteran Tomas Young who was shot and paralyzed less than a week into his tour of duty. Three years in the making, BODY OF WAR tells the poignant tale of the young man�s journey from joining the service after 9/11 to fight in Afghanistan, to living with devastating wounds after being deployed to Iraq instead. Tomas Young worked with musician Eddie Vedder on an album to accompany BODY OF WAR. Visit the Web site for the album and then head over to the blog to tell us about your favorite protest songs. Published on March 21, 2008. Photojournalist Lori Grinker documents the activity of a hospital ship in the Persian Gulf. The official site for the documentary includes behind-the-scenes photos, video and a listing of showings in the U.S. 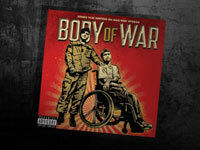 Listen to selections from the BODY OF WAR soundtrack. Bill Moyers interviews former talk show host Phil Donahue and Ellen Spiro on the true cost of war and their documentary, BODY OF WAR, depicting the moving story of one veteran dealing with the aftermath of war. Get information on the numbers behind the conflict  and the controversy over tallying U.S. and Iraqi casualties. 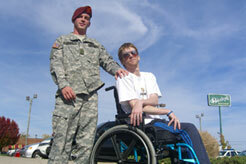 Useful Web sites for veterans and their families. Plus, tell us the songs that inspire you.